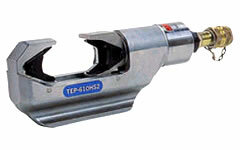 TEP-610HS2 Hydraulic Compression Tools: Izumi Products. Accepts all dies used for Alcoa, Burndy, T & B, Klauke, Cembre, and Blackburn 12 ton compressors when used with a P-U adapter. Steel carrying case with die tray.